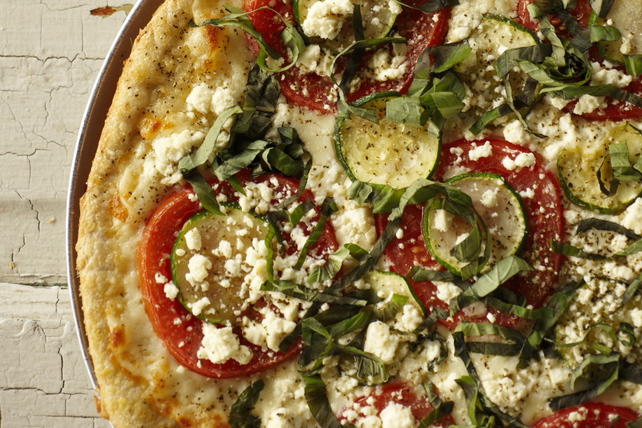 If a trip to Greece isn't in the budget, treat yourself to this Greek-style pizza. Get out the zucchini and feta and let's do it step by step. Place pizza crust on pizza pan; pat to 12-inch round. Brush with dressing. Bake 5 min. Top with vegetables and cheese. Bake 10 min. or until edge of crust is lightly browned and cheeses are melted. Top with basil and pepper. Substitute crumbled blue cheese for the feta.